American Heart Association. The students jumped rope and raised money through pledges. Students who raised at least $100 received a “Heart Hero” t-shirt. Wear Red Day school picture taken on Ash Wednesday. Special thanks to all the families and individuals who came out today and volunteered to make Easter baskets for parishioners. We are headed to start delivering to the nursing homes and brightening days with some Lenten cheer. We we are so blessed to have so many giving people in our school and church family and even more blessed to share this with the community! Thanks all for your participation. ​There is financial aid available to help with the cost of sending your child to St. Peter School. Please contact the school office for information on the NOSF & Ed Choice Expansion Scholarship. The Northwest Ohio Scholarship Fund application period is now open! Go to www.nosf.org to apply. St. Peter School is an approved Ed Choice Scholarship Expansion School. The application widow opened Feb.1st. If your child is on an Ed Choice Scholarship you should be getting a renewal form in the mail. First time applications are available on line at the Ohio Department of Education web site. We received our second check ($198) of the year from Box Tops for Education. Please keep saving them for us. Ten cents for each box tops comes right to the school. Grade 4 celebrates the Seder meal. "M is for Moose" say the preschoolers. ​Amy Hinesman 740-496-1311 for more information. 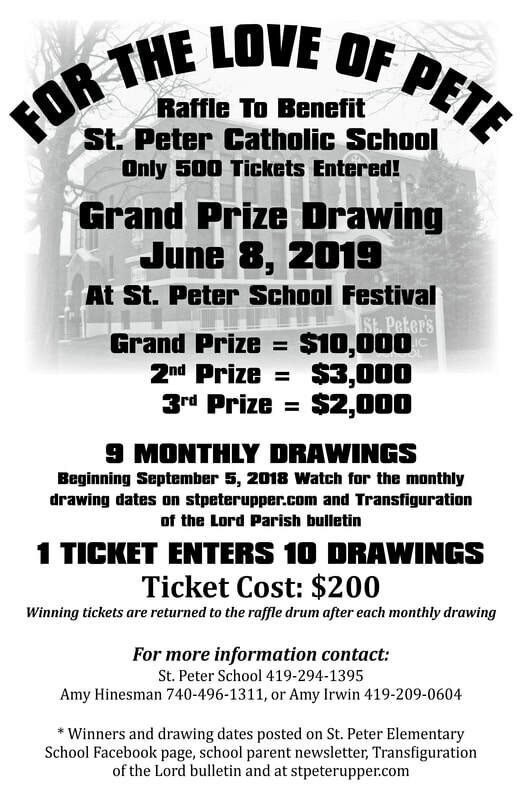 Thank you for supporting St. Peter School. Each fall our 6th Graders attend Leadership Camp at Camp Y-Noah. To raise funds for their camp next fall they will be selling Little Caesars pizza kits. They will appreciate your support. St. Peter’s School is now registered through Amazon Smile. This program is a fundraising program through Amazon.com. Each time a purchase is made through this program, Amazon donates .5% of the purchase price back to the School. Please consider using this each time you purchase an item on Amazon. There is no limit on the usage, and this can be used by anyone who currently has an Amazon account. Please go to https://smile.amazon.com/gp/chpf/about/ref=smi_ge_ul_lm_raas for more details on the program. Click Here For More Information Click HERE to view order form. Thanks to Mrs. Christina Baker for running this program for us. I am always amazed at people’s generosity. In response to a recent mailing to our out-of-town alumni in which we updated them on the current happenings at St. Peter School, I received a phone call from a former student, Dave Logsdon, who wanted to speak further about how best to help our school. In our conversation, he decided to set up a “challenge grant” in memory of his mother, Carol C. Logsdon and in honor of his father, Maury Logsdon. The Logsdon Family Foundation will match up to $10,000 in support for our school, such as: school library, audio-visual equipment, technology, teaching and learning resources, and the gift that keeps on giving, the School Endowment Fund. If you would like to take part in this challenge, please mark your donation: SPS Challenge Grant. We thank Maury Logsdon and his family for supporting our efforts here at St. Peter School. Each gift is a blessing to our students, families and staff. We have received another generous donation to the St. Peter School Challenge Grant, for a total of $6,425. The Logsdon Family Foundation matches up to $10,000. Thank you all for your generous support of our great school!